Fun times with family, and a cozy sweater: that’s what Christmastime is all about! This festive Christmas tree ornament pretty much sums up the holiday season and lets you treasure one of those favorite family memories. 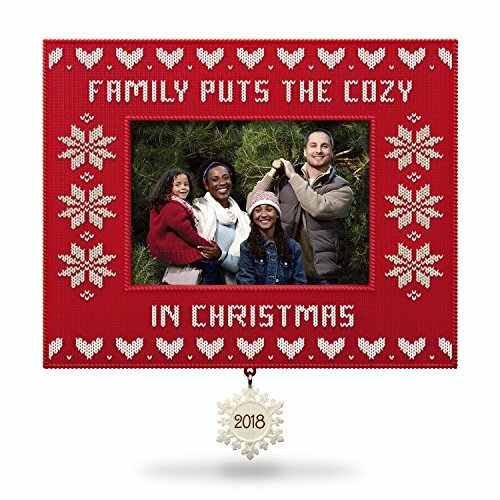 Simply tuck a photo inside the picture frame of the 2018 year-dated ornament with a decorative photo frame that looks like a cozy red and white Christmas sweater. Artist crafted by Ruth Donikowski, this Christmas tree ornament holds a photo. Pre-packaged in a box for easy gift giving, preservation and storage. Year dated 2018 on ornament. On ornament: Family Puts the Cozy in Christmas 2018. Picture frame on front can be personalized with a favorite photo. With unparalleled artistry and exceptional detail, each festive and collectible Keepsake Ornament is made for years of celebrations. From preserving precious memories to commemorating special milestones and interests, there’s a Hallmark ornament for everyone on your gift list. Hallmark has been your family-owned creator of greeting cards, gifts, gift wrap, ornaments and more for over 100 years. We take deep pride in helping individuals connect in just the right way. Plastic Christmas tree ornament is lead-free and measures 4.75″ W x 4.75″ H x 0.4375″ D.
Artist crafted by Ruth Donikowski, this Christmas tree ornament holds a photo. Pre-packaged in a box for easy gift giving, preservation and storage. Year dated 2018 on ornament. Plastic Christmas tree ornament is lead-free and measures 4.75″ W x 4.75″ H x 0.4375″ D.